The birds called out merrily as the elderly unicorn began his walk deep into the forest. The bright green leaves and spots of blue sky turned dark and piney as he journeyed onward. Sun shafts were bright in the gloom, full of dust and promise, they caught themselves in shadows. Dark, cool puddles of shade lay thickly all around. His hooves crunched on needles and dead leaves. A few things thrived in the shade but it was quieter here. He came to a small thicket of white flowered brambles and a tiny clusters of thin trees that grew so close together you couldn't see past them. Gently he nosed through the tiny blossoms, there was a path here if you knew where to find it. He began walking under the arches of tangled vines and leaves that hadn't been taken by the briars yet. Pale bars of light flecked the sweet scented path, they glinted off the crystals in his hide reflecting shades of lilac. 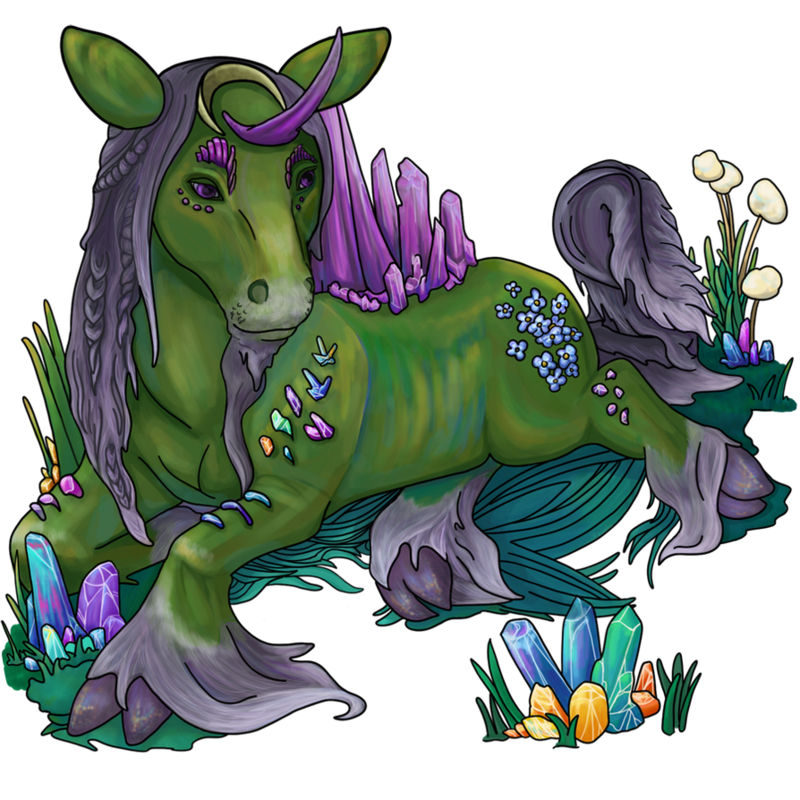 Where his horn touched them it sent cascades of delicate rainbows bouncing through the leafy greenry. He huffed loudly through his nose, and bobbed his head a bit, tail flowing loosely behind him. The birdsong became noticeable again now, followed by the noise of a gentle burbling creek. Emerging from the trees he stepped out into a small glade, it was his favorite for its soft grasses and wise, old trees. A small furry creature with big eyes and a bushy tail noticed him and squeaked happily in recognition. He gave it a welcoming huff and tossed his head to say hello. A small creek fed by a natural spring had become slightly too large farther on, spilling over a short natural bluff, forming a waterfall. The result was a small, tranquil pond, glistening with soothing, silver splashes. The grass was especially verdant and springy around the pool, it was perfect for laying down and having a good, long drink after the journey in. The trees hid and protected the glade, and inside it was warm with bright sunshine. Wildflowers grew all around and it was dotted with mossy logs and broken branches; old stones rested and animals grazed peacefully. Glittering crystals in the long grass and scattered throughout the flowers caught the dappled sunlight and sparkled. Even in shadow they could be found. Floran sighed in contentment. All was well in this moment. The oldest crystals wash out to white with age, tips first, and the ones that fall off or get broken will grow back, not always in the same color however. New crystals are always the brightest and most saturated of colors. Floran has dark purple eyes that reflect gold at night. Gold dust trails off of him when the flowers on his coat are pollinating at least once a year. 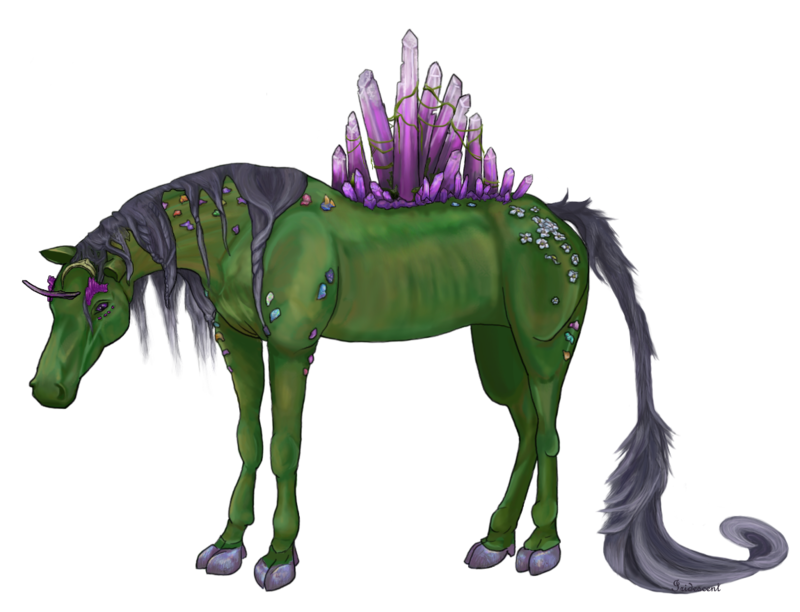 He creates crystals by touching his horn to the earth where flowers or plants grow. The crystals take on the color of the flower or plant and slightly reflect them in their stature. 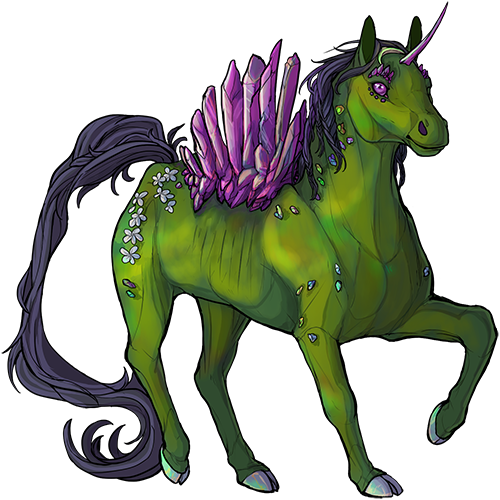 They can be imbued with magic for different things, such as a ward to keep predators away, or keep plants growing and resistant to disease. They are perfect for holding good earth magic so wizards tend to be the ones who value them the most. They can be turned into weapons in the wrong hands but they can never be fully removed from the force of balance that the crystal was made for. Floran doesn't imbue them with any 'extra' spells. They simply and naturally promote goodness for flora and fauna, a subtle boost to the forest's constant attempt to keep balance and have everything grow in a manner that best helps that ecosystem. All fonts are free use for all. Note that the Popoko cutie featured is not a 'real' minion but a Subeta item.